Whilst this blog is mainly concerned with setting up alembic maya export within the University network, most of this is also applicable to other systems. You just need to change all the paths to the corresponding ones on your system. First you need to download and build your alembic maya plugins. These come as part of the Alembic package and you should follow the build instructions. 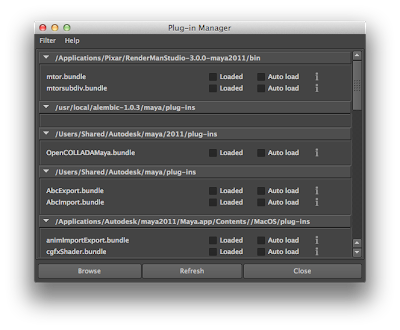 Once everything is built you will have a directory within the source tree called maya/plug-ins. For more info on this read the blog post here. As the command line is a little bit complex, I decided to create a simple GUI to make life easier. The main design for this came from the output of AbcExport -h and all the options printed in the help that actually work have been translated into gui items. The AlembicExport.py script can be downloaded from here and it should be saved in the $HOME/MayaScripts directory. The current frame range is selected and by default uv's and normals will be exported. Other options are available and you should read the AlembicExport help for more details. The actual alembic jobstring and command line is placed in the job string text field so you can copy this if you wish to use the command line at a later date. The code is fairly self explanatory, however I will outline a couple of areas. 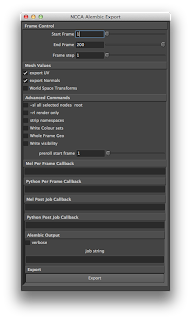 print "AbcExport not loaded please load it"
I've just had an email from an ex student asking about automating the export process from maya as at present they load each scene by hand and then use a particular plugin to export in a new format. 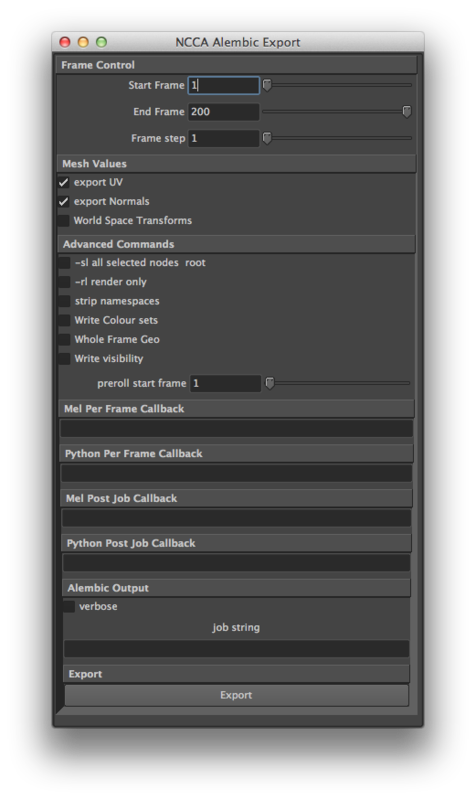 My suggestion was to use the standalone maya python interpretor and try to semi automate the process, to do this I wrote a simple proof of concept as follows. 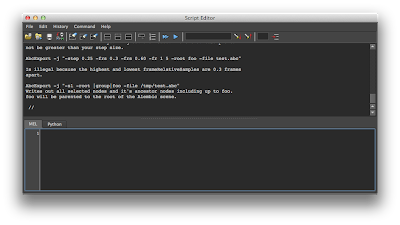 The following script scans the current directory for any maya ASCII files, opens the file and selects all. Then exports this as an obj file. The line above imports the maya.standalone module, next we need to initialise this and tell it which interpretor we are using with the name='python' command. We now have an empty maya environment which should have read our Maya.env so all the paths etc are setup. However none of our default auto-loaded plugins are loaded. In this case I wish to use the obj export plugin so need to load it. As this is a simple proof of concept I don't do any checking to make sure it is loaded etc. The rest of the code uses the standard maya.cmds module to first open the file then select all elements. 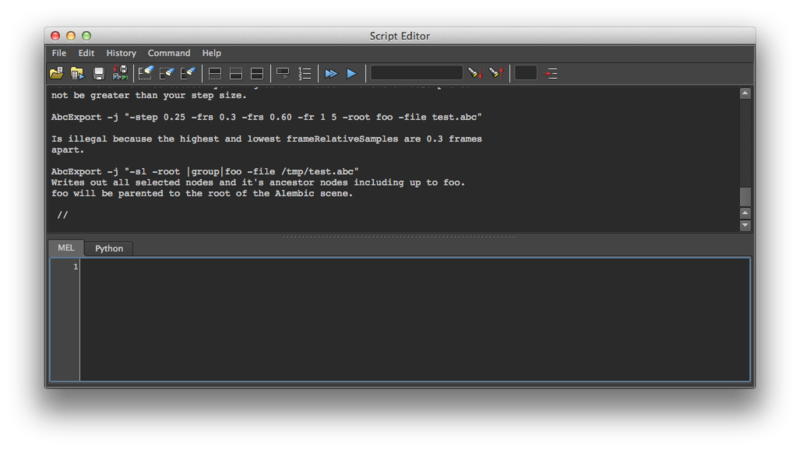 Next I create a new filename by adding ".obj" to the end of the file loaded and export with the file command. As I've been working with the Alembic file I/O system for a while I've been using some of the IMath functions as Alembic is build upon IMath / OpenEXR base code. IMath is a templated maths library that, to quote the website, "Imath, a math library with support for matrices, 2d- and 3d-transformations, solvers for linear/quadratic/cubic equations, and more". Half way through using this I started wanting to use my own ngl::Matrix library as this is integrated into my code base, it when that I discovered that the two were not fully compatible. In the above example the Imath matrix is constructed and will be set to the identity matrix as default. We then use the setAxisAngle method to set the matrix as a rotation around the x axis by xRotation degrees. This method is passed a vector for the axis to rotate around and a value for the rotation which must be converted into radians. The ngl::Matrix class is also set to the identity when it's constructed, and to set the rotation value we use the rotateX method (which expects the rotation values in degrees). As you can see when we calculated the previous MVP matrix it was done using the P*V*M calculation order, now we use M*V*P instead. If you are having any issues just swap the matrix order in these type of functions. As we are starting the group project section of the Masters term I thought it would be a good idea to do some basic pipeline stuff. This example is going to write some simulation data created in a C++ program and then we will write some simple Python scripts to load this data into Maya and Houdini. 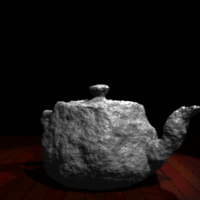 The following video shows the program in action as well as the Maya and Houdini versions. Where the particle data consists of The name of the Particle (in this case P0,P1....Pn) and the x,y,z positions of the particle per frame. The maya version of the program will popup a dialog box to prompt the user to select an input file, it will then parse the file and create a locator for each of the particle names found. Then for every frame a keyframe is created for the locator replicating the animation from the C++ simulation. The code above loads in the maya elements we need, OpenMaya contains the core maya elements we need, the OpenMayaAnim namespace has the controls for all the animation transports such as setting the current frame and maya.cmds gives us access to all the maya cmds similar to the mel commands printed in the console when we generate things. The move locator function, first selects the locator (based on the name passed in), it then calles the move command which will move the currently selected object, finally we set the keyframe. The houdini version of the script will generate a null which is the houdini equivalent of a locator. By default a houdini null doesn't contain any geometry so we also need to parent this to some axis (houdini call these controls). This function is passed the parent node, which in this case will be the houdini path "/obj/" from this we create a new node called a "null" and set it's parameters. In Houdini all parameters can be access using the parm(...) method of the object passing in the name of the parameter we wish to access, in this case "tx/ty/tz". Next we set the keyframes using the hou.keyframe class. In this function we grab the object by name then set the keyframes using the same method as above. Finally we are going to create our nodes and import the file, the file reading code is exactly the same, however we create a subNetwork first to make the houdini scene neater.